Objective: Infections are frequently seen in critically-ill patients and they are associated with increased mortality, morbidity and cost. Antibiotics play a very important role in the prevention and treatment of infections, yet associated with increased resistance especially when used inappropriately. In our study, we analyzed the data regarding antibiotic use before and during intensive care and we evaluated factors related to antibiotic change. 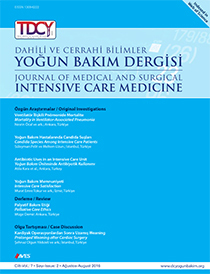 Material and Methods: The study was conducted in a medical intensive care unit (ICU) of a university hospital. Adult patients, who were admitted to the ICU and were using antibiotics in a 1 year-period, were included in the retrospective analysis. Results: One hundred and seventy-six patients were included in the study. 58% of patients (n=103) were male. Mean (± standard deviation) age was 60.9±18.0 years. The percentage of patients who were referred to ICU from emergency room was 73%, while 23% of the patients were referred from inpatient services and 4% of the patients from another hospital. In 83% (n=146) of the patients, antibiotics were started before ICU admission. The primary reason for initiation of antibiotic therapy was recorded as pneumonia in 57% of the patients. Antibiotics were changed in 39% (n=69) of patients upon admission to ICU and in 68% (n=120) of patients during ICU stay. The sequential organ failure assessment (SOFA) score on the day of antibiotic change was higher than the SOFA score on ICU admission (p=0.001). Conclusion: Antibiotic change is highly made in critically ill patients. Mostly patients use antibiotic before ICU admission. SOFA score can be used for antibiotic change decision.